DC Comics brand new Dr Fate series, written by Paul Levitz, together with art by Sonny Liew, colors by Lee Loughridge, and letters by Nick J. Napolitano, ushers in a bold new direction for the character. Doctor Fate #1 follows on directly from events seen in DC’s free Dr Fate Sneak Peak, as Khalid Nasser takes refuge from the storm in the Brooklyn Museum, and encounters an exhibit where an unearthly voice reveals that Amun-Ra has decreed that he use the helmet of Fate to save the world from the flood Anubis has released to usurp the natural order of things. Blood of the Pharaohs is an engaging and thoughtful opener to this new Dr Fate series, there’s plenty here for fans of the character to enjoy, and it also provides an excellent jumping on point for new readers too. Paul Levitz skilfully mixes the myth and magical elements with Khalid’s life in the modern world. Freaked out by what he’s seen, Khalid legs it out of museum and decides to make his way home on the subway. Levitz uses this opportunity to introduce us to Khalid’s world as he ambles down to the platform: there’s a fun series of text messages between Khalid and his girlfriend, Shaya, a call from his mom, his cat, Puck, meanders home between the raindrops, and Khalid’s dad is busily driving an irate passenger to the airport in his cab. 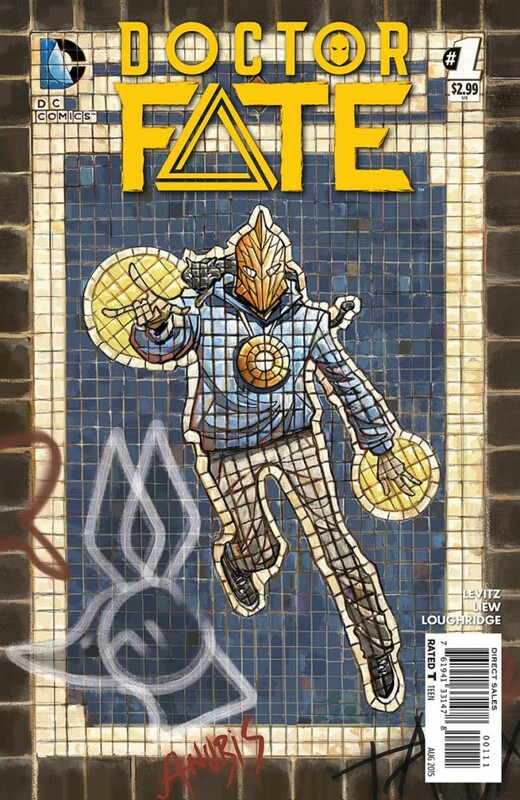 Considering how Dr Fate has spent the latter half of his time in The New 52 either being beaten senseless or left raving half out of his mind, this new version of Khalid / Dr Fate comes across as just an everyday student, someone with an everyday life and family, and it brings a refreshingly modern slant to the character. With his distinct sketchy cartoon style, Sonny Liew’s artwork is a perfect fit for this modern take on the character, and it brings Levitz’s magical blend of Egyptian mysticism, wry humour, and brooding atmosphere together with the legacy of Dr Fate to craft something very special indeed. The characters expressions are rendered beautifully, conveying every nuance and emotion. The rain swept streets of Brooklyn look brilliant, I adore how Puck the cat wanders so casually through the narrative, its sublime, and the big set-piece in the subway station is absolutely thrilling. The colors by Lee Loughridge gloriously complements Levitz’s art with vividly eloquent tones, and the letters by Nick J. Napolitano bring a distinct edge and heightened sense of clarity to the issues most pivotal scenes. As the fates converge the time comes for Khalid to accept his destiny, the issue brings this origin story full circle, and a new Dr Fate emerges amidst a wonderful mosaic of images that meld reality and magic like never before. Throw in this issues closing, and somewhat sinister final scene, and you will be left eager for more. Sonny Liew’s imaginative cover is amazing, it really makes this book jump out at you, and I also really liked Ibrahim Moustafa’s variant cover as well. I think Paul Levitz has done a fantastic job with the characters and the storyline for this first issue, the premise works so well, and with Sonny Liew’s excellent artwork, Doctor Fate looks set to become one of DC’s standout new titles of 2015. Some months have passed since the Joker unleashed the Endgame virus on Gotham City. Now in Batman #41 we rejoin a city whose infrastructure and citizens are far from healed. Gotham’s Dark Knight has fallen, but a new era will rise, one where Jim Gordon take over the fight against crime following Batman’s demise – equipped with an advanced high-tech Bat-Suit – to become the all new Batman and protector of Gotham City! Following the epic showdown between Batman and the Joker in Endgame, the time has come to discover where Snyder Snyder’s and Greg Capullo’s next major story-arc will take us. 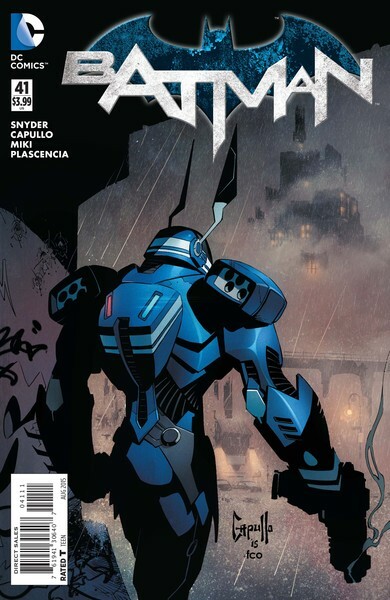 After all the teasing images and New Comic Book Day sneak peeks the “All New Batman” finally makes his debut in Batman #41, as Scott Snyder’s fifth year in Gotham ushers in a whole new direction for Batman when Jim Gordon suits up as Gotham’s new robotic Dark Knight. The people of Gotham are still recovering from the carnage that Endgame wrought upon the city and their lives. Batman has seemly perished along with the Joker during their fateful final battle. A new Bat-Signal beams down from the night sky as Jim Gordon gets ready to hit the streets in his new Bat-Suit, plummeting from a modified airship to face a bio-electrical creature attacking Little Cuba in the Narrows. After months of training and indecision, the time has finally come for Jim Gordon to find out if he’s ready to be Batman! Endgame was certainly a game changer, in every respect. So, how do you follow that? Easy, instead of just putting someone else in the cape and cowl who we might’ve expected to carry on the legacy of the Dark Knight, Scott Snyder boldly circumvents the been there, done that, and already got the T-Shirt approach to bring us something far more innovative and unexpected in Batman #41 as Jim Gordon takes centre stage in the new Bat-Suit. 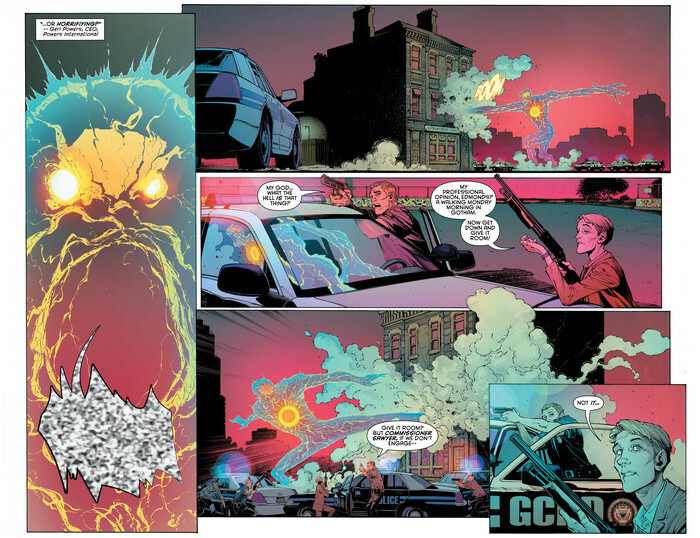 The GCPD’s most stalwart Police Commissioner and former Marine is the third character Scott Snyder has written for in the Batman suit. This issue really allows Jim Gordon a chance to shine like never before as Snyder intercuts present events with Jim’s journey to becoming Batman over the last three months, from his initial meeting with Geri Powers, to sharing his thoughts with Harvey Bullock about the project, the ingenious narrative approach will keep you thinking “Bat-Thoughts” all the way, and it even knowingly speaks to some fans reservations when Jim claps eyes on the Nano-Carbon “Robobat-Bunny” suit for the first time. This issue also introduces Geri Powers, the CEO of Powers International, who has big plans to honour the memory of Batman’s work, one what will shape the very future of law enforcement in Gotham City. Jim and Geri have a lot in common, and their banter makes for some of the issues best moments. They seem to share a vision to restore peoples trust in the city and the systems which run it, the GCPD didn’t exactly do a very good job protecting Gotham’s citizens during the Endgame crisis, so their new Batman will become an extension of Gotham City itself rather than being perceived as an outlaw, and hopefully rebuild faith in the city. Greg Capullo’s art is as exceptional as we’ve come to expect from his work on this series. His portrayal of Gotham is as impressive as ever, Capullo seamlessly melds current events with the flashbacks, and it’s fascinating to see these insights into Gordon’s path to accepting his new role as Batman. Danny Miki’s inks complements Capullo’s art perfectly, bringing added intensity and clarity to every page, while FCO’s exquisite colors and tones heighten the emotional impact of Batman’s demise while balancing it with the exciting debut of the new robotic-suited Batman. From the opening monologue in the twilight, to the stark symbolism of the new Bat-Signal mirroring how much things have changed since Endgame, though to Jim’s first mission in the Bat-Suit – and just for the record, I loved the app for those color schemes – the times they sure are a changing. The suit itself is a terrific design, one that’s bristling with high-tech wizardry, armaments, gadgets, and perhaps most surprisingly of all, it also possesses incredible agility that belies the suits size. It’s not long before Batman is going toe to toe with the bioelectric creature in Little Cuba, the battle is intense to say the least, but it is Jim’s experience and quick thinking that soon pins down who is actually controlling the creature and where they really are. Batman #41: Superheavy Part 1 confidently sets up this brand new story arc in fine style, it might be all monsters and robots on the surface, but its the underlying themes of what Gordon and Powers are trying to achieve that knits everything together so well. Jim has been provided with a great supporting cast of characters too, I especially liked the scene with Lieutenant Bullock, there’s even a new “cave” of sorts, and it all makes the transition into this new era that much easier to accept – if anything it feels like a completely natural progression of events following Endgame. So… is Batman #41 any good, does this new Jim-Bat concept really work, that’s the burning question isn’t it? Well, it’s difficult to decide after only one issue, but I‘d say that Snyder and Capullo have played an absolute blinder here. It does work, it’s as though they’ve spliced the classic Batman elements with the GCPD, added a Sci-Fi sheen of Robocop, and the result is probably one of their boldest, action-packed, and most off-the-wall stories ever. 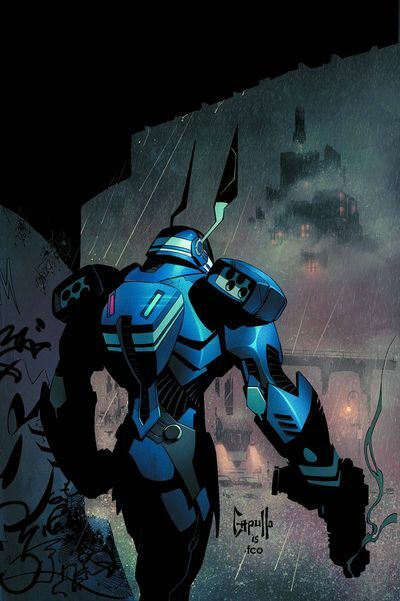 I’ll be the first to admit, I’m still not 100% completely sold on the idea, but it did genuinely surprise me just how good this new Bat-Bot / Jim Gordon storyline actually turned out to be. This may not be the Batman we are accustomed to, but it’s going to be a blast to see how Jim Gordon settles into his new role and I’m looking forward to seeing what’s in store for Gotham’s Nano-Carbon Dark Knight. Snyder and Capullo have certainly defied all our expectations once again! Gotham’s new robotic-suited protector makes an impressive debut in Batman #41, in a slick, exhilarating, and thrilling new storyline – together with a killer final page to round off the issue – I have a feeling that Jim Gordon’s tenure as Batman is going to be pretty damn good! The showdown between the notorious Elizabeth Bathory and the Lord of the Vampires reaches its blood-drenched conclusion in Blood Queen Vs Dracula #4, as this new four-part Dynamite mini-series written by Troy Brownfield and illustrated by Kewber Baal, with colors by Kirsty Swan, and lettered by Marshall Dillon, sees these iconic horror characters locked in mortal combat as their enemies close in to attack them. 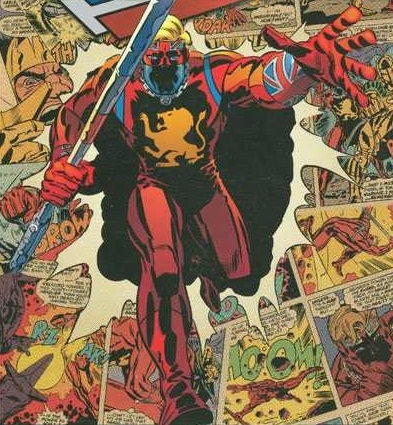 The final issue of this four-part mini-series enables writer Troy Brownfield to bring all the plot threads involving the Blood Queen, Dracula, and their common enemies in the Otterman Empire, together for one last brutal fight to the end. The world is indeed painted blood in this action-packed finale! Until now we have only seen the minor skirmishes. Here we finally see the Blood Queen and Dracula really cut loose, no quarter is given between them, and their battle becomes a whirlwind of magic, transformation, stone, bloodshed, and even steel! Blood Queen Vs Dracula #4 is lavishly illustrated by Kewber Baal. Indeed, Baal’s exemplary work on this mini-series has brought this stunning world to life in exquisite detail. 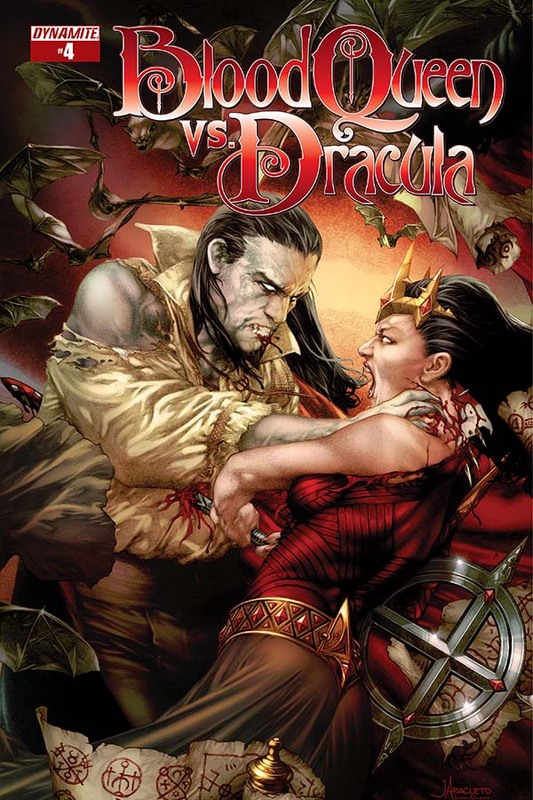 Castle Nadasdy in the Blood Queen’s kingdom of Varanno is the setting for this final confrontation, it provides a perfect battle ground for Elizabeth and Dracula to uses their powers to the full, and Baal ensures every moment is captured in vivid detail. The rich colors by Kirsty Swan also imbue every scene with added textures, providing subtle flourishes and tones, as blood, twirling mist, and crimson magical energies tear across the pages between these two powerful combatants. Blood Queen Vs Dracula #4 brings this Dynamite mini-series to an exciting and immensely satisfying conclusion. Troy Brownfield’s dramatic storyline has built into a sweeping blood-splattered epic, its been great to see two horror icons like the Blood Queen and Dracula clash while their Ottoman enemies rise against them, and the excellent art by Kewber Baal has immersed us in every glorious moment of visceral bloodshed while the power struggle between Elizabeth and the Lord of Vampires thundered towards its climax. This new Dynamite mini-series has been a firm favourite of mine over the last few months, it delivered on every level, and I certainly hope we get to see the Blood Queen and Dracula cross swords again one day. Yes, my blog Sci-Fi Jubilee has now reached its 3rd anniversary, and seeing how this post would also be the sites 350th I thought it would be a perfect time to celebrate three years of Sci-Fi Jubilee. I’ve had a great time writing reviews and articles over the last three years. The time has flown by so quickly. I hope that I’ve managed to bring you a good range of TV, film, and comic book reviews along the way, many of which also reflect the genres and things I enjoy most – especially Doctor Who, The Walking Dead, and of course Batman comics. Finally I’d like to say a big thank you to everybody for reading my blog and sharing it on Twitter, WordPress, and Sci-Fi Jubilee’s Facebook page as well. I have had an absolute blast writing Sci-Fi Jubilee over the past three years, but it is your comments and support that is what really makes Sci-Fi Jubilee such a hugely enjoyable and rewarding experience for me. When I first started this blog I could never have imagined that I’d still be writing it three years later, let alone that it would also lead to me writing for other websites as well. Cheers everyone and thank you all so much for your awesome support! Here’s to another great year!